Kindly loaned to me by Hirondelle.This was a lovely story, and just what I was in the mood for! I agree it's not as substantive as Beyond the North Wind, but the dragon is lovely, the setting wonderful, and I love Prahotep's cleverness and his surprise when others recognize that he IS clever and loyal and a good friend. Really enjoyed this. For some reason, learning that the winds blew the opposite direction from the flow of the Nile, so Egyptians could float downstream and sail up, really tickled me. Cool historical detail! I was in the mood for a story set in ancient Egypt without any over-dramatized court intrigue and the odd premise of a dragon in Egypt sounded interesting (there were no European-type dragons in ancient Egypt, but there were snakes with bird wings), so I decided to give it a try. It started out pretty decent and there's lots of kids who would enjoy it. It could have been better, though. While the main character is engaging and relateable enough, the fact that he literally can't do anything right got old really fast. 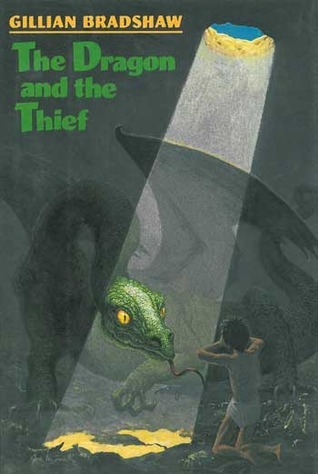 Further, as a budding Egyptologist, it annoyed me somewhat that the author credits a DRAGON, which is a EUROPEAN folktale, for the creation of an AFRICAN civilization. I don't mind weird ideas, but at least pay the cultures you're writing about a little respect. I might have enjoyed it more when I was younger and didn't know quite so much about ancient Egypt. One of my all time favourites when I was a child. I read this book so many times. The reason I loved it was probably becaues I found it unique. Even though the story is somewhat predictable, the story is still different from other books, and it has an interesting story and funny characters. A great read for children and those who are still a child at heart! As a kid, I would forcefully push away any book that was suggested to me. I chose this book for myself and maybe thats why I was so crazy in love with it. The characters struggles in this book would probably speak to any kid who always felt that adults were bullshitting them. A young Egyptian is plagued by bad luck until he encounters a lone dragon while robbing the wrong tomb. The first time I read this book, I was in middle school. I have been in love with it ever since.